Alzheimer’s disease (AD) is currently recognized as an untreatable, progressive, degenerative and terminal disease, and is afflicting over 36 million people worldwide, with the number of cases increasing in a frightening and an unabated manner. The goal of the series Advances in Alzheimer Research, beginning with Volume 1, is to provide an integrated approach to AD from basic and clinical research and to highlight the latest information in order to understand the origin, pathogenesis and prevention of AD. The aim is to both capture and discuss improvements toward the diagnosis and potential treatment of AD by both established and novel strategies. This book series, starting with the present volume, provides an important mechanism to bring under the same roof a variety of scientific interests and expertise to specifically focus on AD and related dementias. The fullest attempt has been made to disseminate the most updated knowledge on recent advances in potential therapy of AD. 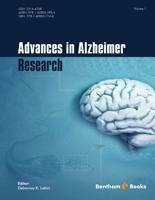 This volume includes selected highlights from articles that have been published in Current Alzheimer Research and have recently been updated for this book. The choice of subject matter comprises an expansive and informative collection of mechanistic and translational research articles that typically represent publications in Current Alzheimer Research. Each represents a broad, provocative and forward-looking article, compelling to read for those both in the neuroscience field and outside of it. It is gratifying to have 13 excellent contributions that constitute the present issue and that successfully meet these criteria. The etiology of AD and mechanism(s) of amyloid plaque depositions in late-life remain unknown. The role of environment, early-life exposure, education, physical activity and lifestyle are important for the sporadic (and most common) cases of AD. The first article discusses an integrated approach to address how and when environmental agents and dietary factors affect the course of AD (Lahiri et al., pp 3- 27). The proposed “LEARn” Model (Latent Early-Life Associated Regulation) may explain the triggering of AD, and suggest possible remediation’s. AD is notably a human neurodegenerative condition. However, rodents, and especially transgenic mice expressing human proteins relevant to the disease or knockout mice with specific genes/proteins deleted, have proved to be important tools to uncover molecular mechanisms underpinning the disease process. Furthermore, such AD models are helpful to test potential efficacy of therapeutic interventions, as discussed in several of the articles of this volume. Major hallmarks of AD are brain deposition of the amyloid-β peptide (Aβ), which is cleaved proteolytically from a large (100–140 kDa) Aβ precursor protein (APP) by β-secretase, and β-secretase activity. Notably, a transmembrane aspartyl protease, β-site APP cleaving enzyme (BACE1), has been characterized as the β- secretase. In addition, the ?-secretase complex is responsible for the generation of the Aβpeptide that forms the amyloid plaques of AD. The amyloid hypothesis remains probably the main strategy of the majority of experimental drugs and biologicals currently being developed for the treatment of AD. The major evidence comes from genetic studies that Aβ accumulation in brain can be increased by mutations in APP, presenilin-1 or -2 (PSEN1 and PSEN2, respectively) and other genetic polymorphisms/mutations that can lead to a similar outcome by either elevating the generation of A42 or reducing its clearance. These studies open up multiple potential points of intervention in such a cascade of events, and some are utilized and described by the researchers represented in this volume. In this light, apomorphine (APO) has been shown to be a novel drug that promotes degradation of intracellular Aβ (Ohyagi et al., pp 28-46).APO treatment improved memory function and AD pathology in an AD mouse model, suggesting being a promising drug target for AD. The pathogenicity of intracellular Aβ and potential of APOfor the therapeutics in AD would bridge a current unmet need. Regarding protective mechanisms against Aβ42 aggregation, several molecules and mechanisms inhibit Aβ42 aggregation, including heat shock proteins, heme, methionine oxidation, and Lipocalin-like Prostaglandin D Synthase (L-PGDS). The implication of these protective mechanisms to AD pathogenesis and to interventional strategies makes another important contribution to this volume (Yan et al., pp 47-64). How Aβ42 peptide causes memory deficits is hotly debated in the field. Notably, an increase in levels of Aβ42 in the prefrontal cortex is associated with a reversal learning impairment in AD model Tg2576 APPSWE mice (Zhuo et al., pp 65-80). These data indicate that the early appearance of reversal learning deficits in these mice was perhaps due to the localized increase of Aβ42 in the prefrontal cortex. APP processing enzymes responsible for the production of Aβ peptides remain the major focus of academic and pharmaceutical research. Recent advances in the a- secretase pathway, and the regulation of APP and GPI-anchored cellular prion protein (PrPc) processing by this enzyme is reviewed (Vincent et al., pp 81-104). Putative therapeutic approaches are highlighted, which could be undertaken regarding the treatment of two apparently distinct diseases (AD and transmissible spongiform encephalopathies) that share common pathways. The role of metal and proteases, such as a –secretase, in APP processing is greatly recognized. In this context, the review of the regulation and activation of metalloproteinasemediated APP a -secretase cleavage is noteworthy (Postina et al, pp 105-127). BACE1 and β-secretase take center stage from any of the other secretases. BACE1 activity is necessary and specific to production of Aβ from APP. The structure and function of the BACE1 protein, and of 4129 bp of the 5’–flanking region sequence of the BACE1 gene and its interaction with various transcription factors are important in cell signaling (Lahiri et al., pp 128-146). Notably, the promoter (regulatory) region and 5’-untranslated region (UTR) contain multiple transcription factor binding sites, such as AP-1, CREB and MEF2. Functionally, a 91 bp fragment is the shortest region with significant reporter gene activity and constitutes the minimal promoter element for the BACE1 gene. The BACE1 promoter consists of at least six unique functional domains and three structural domains of increasing sequence complexity as the “ATG” start codon is approached. The BACE1 gene promoter contains basal regulatory elements, inducible features and sites for regulation by various important transcription factors. The interaction of the BACE1 promoter with these transcription factors can modulate synaptic plasticity, oxidative stress and neuronal apoptosis- all are pertinent to the pathogenesis and progression of AD. In this context, the family of enzymes involved in regulated intramembrane proteolysis, including ?-secretase, is important for the processing of APP. The biology of ?-secretase, an enigmatic enzyme complex, and its role in AD are discussed here (Dries and Yu, pp 147-186). Activity of ?-secretase is also necessary for generation of the Aβ peptide that mostly makes up the amyloid plaques of AD, although ?-secretase processing is also part of the non-pathogenic “a” pathway. Identification of the four major components of the ?-secretase complex- presenilin, nicastrin, homolog of anterior pharynx defective 1 A (APH1A, Aph-1), and presenilin enhancer 2 (PENEN, Pen-2), sheds light on the role that each exerts on the maturation and activity of the complex. The known subcellular locations of each ?-secretase component and the sites of ?-secretase activity, as defined by the generation of Aβ, are also summarized. Taken together, identification of an overarching model for the assembly and trafficking of the ?- secretase would form the ideal platform to address additional questions into the biology and function of ?-secretase relevant to AD. In addition to plaque deposition, AD is characterized by elevated inflammation. Notably, pro-inflammatory cytokines and anti-inflammatory drugs modulate glial expression of apolipoprotein E protein (ApoE) (Aleong et al., pp 187-204). ApoE acts as an inflammation modulator because its release is controlled by proinflammatory cytokines and diminished by NSAIDs. This corroborates the role of elevated cytokine expression in AD on directly modulating inflammation, and on indirectly neuronal remodeling as mediated by ApoE. Furthermore, the role of lipoprotein receptors in AD is being elucidated (Maier et al., pp 205-233). It is important because the LDL receptor gene family comprises a class of structurally closely related cell surface receptors that play diverse functions in different organs, tissues, and cell types. The LDL receptor represents this family, which also includes the VLDLR, ApoER2/LRP8, LRP1 and LRP1B. Recent studies have suggested the LDL receptor gene family as one of the key players in AD. This receptor family assumes significance due to its critical function in cholesterol/ApoE uptake, with the e4 allele of APOE as the strongest genetic risk factor for late-onset AD. It has been established that cholesterol metabolism of the cell has a strong impact on the generation of Aβ leading to the formation of plaques observed in the brain of AD patients. From the role of amyloid, apolipoprotein, and secretase and cytokine comes the turn of t-protein loaded neurofibrillary tangles, another major hallmark of AD. Alonso and colleagues (pp 234-259) discuss t-induced neurodegenerationin AD and related tauopathies. The accumulation of hyperphosphorylated tprotein is a shared feature of several dementias. The t protein (Mw ~50-55 kDa) is one of the important brain microtubule-associated proteins. Normally, the t protein functions in microtubule assembly and stabilization and interacts with other proteins, membranes, and DNA. These authors further discuss several important posttranslational modifications, such as glycation, glycosylation, hyperphosphorylation, ubiquitination, nitration, acetylation, and truncation. These post-translational modifications can alter t’s biological function, t self-assembly, and t polymerization—all are potentially important AD drug targets. At the clinical front, prevalence of neuropsychiatric symptoms in AD and Vascular Dementia is discussed (Fernandez-Martínez et al., pp 260-280). The only significant differences between AD and VaD patients were more prevalent and severe sleep disturbances, appetite changes and aberrant motor behavior in AD. Aging is the greatest risk factor for AD, where aberrant plasticity is critically involved. Synaptic membranes contain the greatest amount of docosahexaenoic acid (DHA) of all cell membranes. Synapse density and levels of DHA are reduced in aging. Interestingly, epidemiological studies suggest that DHA consumption is associated with a reduced incidence of AD. Increase neuroinflammatory reaction frequently observed during normal brain aging may suggest the long-term use of “fatty aspirin”, which is a combination of DHA and aspirin. This strategy may potentially postpone, or prevent, the structural neurodegeneration of the brain (Pomponi et al., pp 281-318). In summary, this volume captures a window, in the form of13stimulating articles, of thought-provoking ideas focused not only on the latest advances in AD research, diagnosis and treatment but also on identifying the most critical gaps in our knowledge that require filling. Future volumes of this series will tackle other crucial hypothesis-driven strategies to slow or potentially halt the progression of AD, most likely a combination of approaches may ultimately prove most effective, as found in other diseases. I express my sincere gratitude to the authors for the significance of their articles, for their endurance in undergoing peer review, and for their patience in awaiting publication. Both the publisher and I are appreciative of the numerous scientists that assisted in the peer review process. I wish to thank the authors, publisher and staff of Current Alzheimer Research for their cooperation and efforts in the creating of this eBook series. I am also grateful to Prof. Rudolf Tanzi for his advice, support and writing a Foreword to volume 1 of Advances in Alzheimer Research. Finally, the year 2013 brings hope and optimism in the AD research community due to its great challenges and opportunities. What was said one hundred thirty years ago by the then-Editor of Science in its inaugural issue is true again (King, Science 1(1): 1–3, 1883): “[T]he scientific sky is clear, and the outlook quite promising. If we follow a course true to itself and to its surroundings, … science has nothing to fear from the future.” With the hope of increasing public and private support for AD research, Advances in Alzheimer Research embarks upon a bright future. May this eBook series succeed by recognizing the progress in AD research and by accepting and adapting to new challenges. At this moment, please join me in helping it march forward.